Dundee United have signed Willo Flood on a two-year deal after the midfielder was released by Middlesbrough. The Republic of Ireland international had a medical and scans on Monday. United manager Peter Houston is delighted Flood chose to return to the club despite receiving more lucrative offers from other clubs. "This signing is very much a coup for the club and I know the fans will be excited at the prospect of seeing Willo in a United shirt once more", he said. Flood, 26, was a popular midfielder at Tannadice from 2007 to 2009, when he made 56 appearances before Gordon Strachan signed him for Celtic. With the departure of midfielders Prince Buaben, Craig Conway and Morgaro Gomis, the arrival of Flood will be a boost to Houston. "I am thoroughly delighted to have secured Willo. We know all about his qualities from his previous spell here and as I look to add experience to the team, I see him as an excellent and important addition", the United boss said. "We knew we had to add experience to the squad and with this acquisition; we have again ticked all the boxes I was looking for in a new signing." It is thought Aberdeen and Hearts were interested in him but Flood's positive experience of his time at the Tayside outfit swayed it in United's favour. 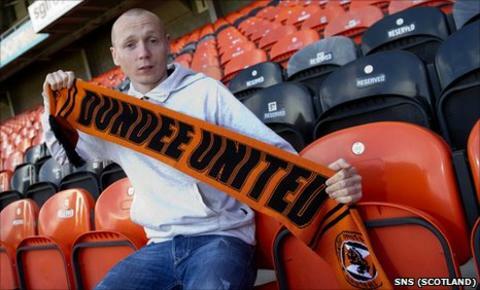 "It says everything about Willo that he has chosen to come to Dundee United", Houston commented. "He had more lucrative offers available but not only has he enjoyed his football here previously, he sees Tannadice as a place where he can enhance his career. "He also has the opportunity to experience European football next season and that is something not all clubs could have offered him."